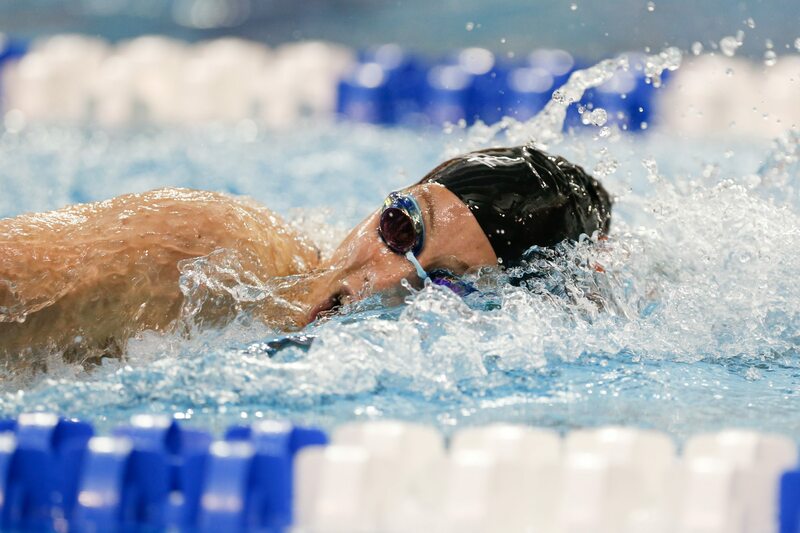 The 200 free is a fun event, as it tends to be the collision point between sprint starts, distance stand-outs, and just all-around great swimmers. 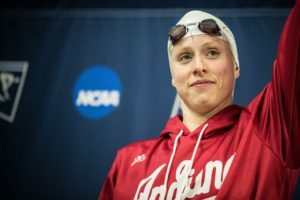 Case in point, over the past six or seven years, we’ve seen individual Olympic gold medalists Missy Franklin, Katie Ledecky, and Simone Manuel all contest this event at NCAAs. While there’s not quite the same level of star power this year, we will get to see two of the top contestants in this event over the past few years collide with a freshman who seems on track to win an individual Olympic medal before too long. Last year’s 3rd-place finisher Manuel was the only one senior in last year’s A-final, meaning we’ll have seven returning A-finalists competing in this event this year, although many of them are lurking way down the psych sheet. Two-time defending champion Mallory Comerford tops the psych sheet with a 1:41.29. 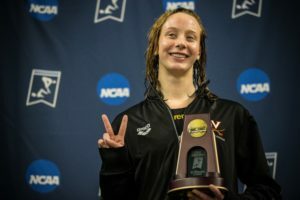 The Louisville senior has finished in the top two in this event every year of her NCAA career, starting at 2nd as freshman, then tying Ledecky for the title as a sophomore, then finally winning outright last year with a 1:39.80. 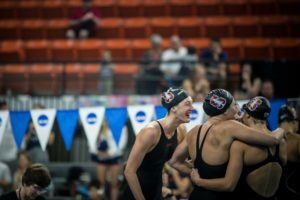 Comerford’s biggest new threat sits at #6 on the psych sheet in the form of Stanford freshman Taylor Ruck. 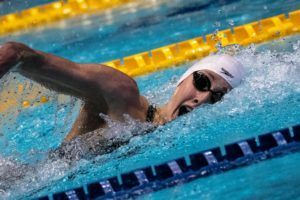 The Canadian Olympian owns a long course best time of 1:54.44, which suggests she can definitely give Comerford a run for the title, but it’s tough to predict how any freshman will fare in their first NCAAs. Still, no one would should be too shocked if Ruck takes the win, or even challenges the U.S. Open Record in the event. Michigan senior Siobhan Haughey has made the A-final each of the last three years, steadily moving up from 5th to 4th to 2nd. She has the 2nd-fastest time in the NCAA this year, with her 1:41.57 ranking only behind Comerford, and she should be a favorite for a top three finish. Katie McLaughlin pulled off the 100 fly-200 free double last year, finishing 6th and 8th respectively, and the Cal senior will be attempting the same feat this year. Her entry time of 1:43.04 is well over a second faster than her entry time from last year, and while that’s a tough double, McLaughlin has looked sharp all season. 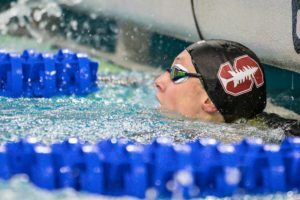 Stanford’s Katie Drabot finished 4th last year, and while she’s only seeded 29th this year, the fact that she’s seeded 2nd in the 200 fly indicates that she’s still likely to do well next week. Cal’s Robin Neumann replicated her entry time of 1:43.38 last year to make the A-final. This year, her seed time of 1:43.25 is just a bit faster than last year’s time of 1:43.38, but she sits at #9 on the psych sheet, meaning she’ll need to drop a little more time to make the A-final again, after finishing 5th last year as a freshman. Texas A&M’s Claire Rasmus and Virginia’s Megan Moroney also return from last year’s A-final. While they’re only seeded 16th and 23rd respectively, they’re both capable of popping up off a big a swim and making the top eight once again. Most of the top eight names on this year’s psych sheet, however, consist of those who did not make the A-final last year. Leading that category is Cal’s Abbey Weitzeil. 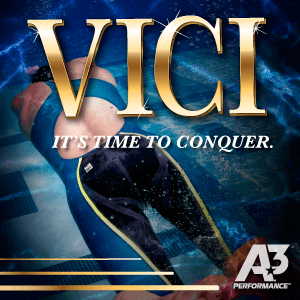 While she’ll get the most attention for her 50/100 free prowess, and rightfully so, her 1:41.97 from Pac-12s was her first personal best in this event in three years, and puts her at #3 on the psych sheet. Right behind her is Michigan senior Catie DeLoof, who was 11th last year with a 1:44.33, but has already been much faster this year, posting a 1:42.55 at last month’s Big Ten Champs. Erin Falconer seems to have flourished in her senior year under new Auburn head coach Gary Taylor, and her entry time of 1:43.04 is almost two seconds faster than her personal best time heading into this year. Minnesota’s Chantal Nack has had a similarly successful senior season, as her seed time of 1:43.16 is well over a second faster than her fastest time prior to this year. The two seniors sit at #7 and #8 on the psych sheet, respectively. Dark horse: Cierra Runge has a lifetime best of 1:42.73, which would easily qualify her for the A-final if she can hit it again here. However, that time is four years old at this point, and her season-best time of 1:44.04 only puts her 17th on the psych sheet. Still, Bob Bowman knows a thing or two about coaching 200 freestylers, so watch for Runge to make a push for the A-final here. I don’t agree that Comerford’s biggest threat is the number six seed on the psych sheet. I would be shocked if Ruck takes the win. I think she will finish behind Haughey, Weitzeil, and DeLoof. 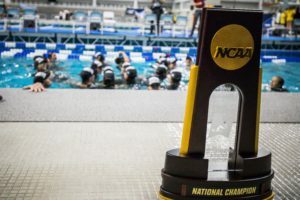 Ruck is a really good swimmer but I think that Haughey and Deloof will have the intangible senior advantage thing going on in their last NCAA. Also if Weitzeil can maintain her speed through out the last 50 she will beat Ruck too. Ruck won silver at World SC champs 2 1/2 years ago in a time that converts to a 1:40 low, she will be top two. Ruck could do everything (also threaten Franklin’s American Record) regaining the form she had last season, when she trained at HPC. Unlikely, because her in-season performances in this rookie-season at Stanford have been clearly at a lower level, also at the Conference Final (even if that final 100 free in the relay was fairly good). We’ll see how taper works. Ruck is a stroker; that’s why she excels in metres– more work to do on the surface. But SC yards have her at a disadvantage because the weakest part of her game is her underwaters. She regularly breaks out earlier than the rest of the field and watches her competitors streamline past before surfacing ahead of her, leaving her to play catch up if she can. She’ll be in it until the third turn and then she’ll fade. 5th, maybe 4th. Nice analysis. Ruck does have a beautiful distance per stroke. I would nearly agree with you but then what about Missy? Missy was very much a LC swimmer and not SC for similar reasons– weak underwaters. But yet that 1:39:1 OMG! What’s exciting is that we just don’t know what Ruck will do. Mallory is HUNGRY (and I love this about her as a swimmer) so I give this race to Mallory– she wants the record but may fall just a bit short. Siobhan is underrated. I could see Ruck third but close.